Acton, Mass. -- For a seasoned program like Newton North, where postseason placement seems irrelevant. When it comes to the Tigers, seeding is a mere numbers game. The defending Division 1 North champions proved that during Monday's 6-0 victory over No. 2 Acton-Boxborough in the quarterfinal round. 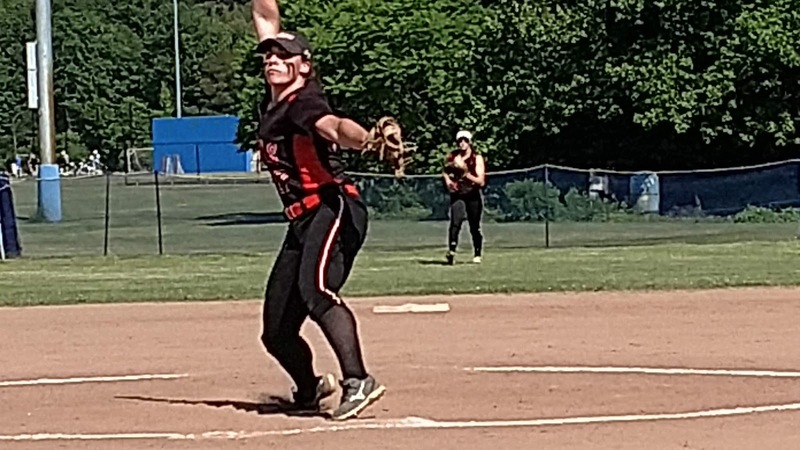 Newton North, seeded seventh, moves into the semifinals where it will await Tuesday's Medford vs. Arlington winner. The Tigers (17-4), who perhaps are playing their best ball of the season, jumped on the Colonials (19-3) early and often. Senior pitcher Mia Patriacca held A-B in check throughout the afternoon. The Assumption College-bound right-hander scattered just two hits and struck out three. With the Colonials showing tremendous enthusiasm at the start, the winds were quickly taken out of their sails in the opening inning. A lead off single by Emma MacLean was followed by a pair of errors loading the bases. Patriacca then plated MacLean, lofting a sacrifice fly to bring home the game's first run. Colonials ace pitcher Lauren Meinhold, a sophomore, ran into more trouble in the second. Singles by Ciara Gillen and Tara Eldredge got things started. Two batters later, Arpino strode to the plate now with the bases loaded. 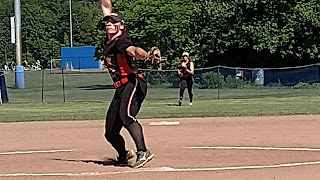 Not wanting to see the frame be wasted, the Stonehill College-commit lined the first pitch she saw down the right field line for a two-run double to put Newton North on top, 3-0. "We wanted to come out and score early and hopefully get them a little rattled," said Arpino. "We then wanted to keep the pressure on them after that. During the regular season we play competition that is similar to what we will see in the tournament which is good for us." With Patriacca holding down the fort inside the pitcher's circle, the Tiger bats continued to prosper. In the top of the fourth, Meinhold set down the first two batters with ease before issuing back-to-back singles to MacLean and Antonelli. Once again Arpino came to the plate, and on 1-1, she grounded a hard single to center that scored both MacLean and Antonelli to make it 5-0. "There is a reason why we play the type of league and non-league schedule we play," Tigers coach Lauren Baugher said. "It's to get ready for games like this. I think we had the experience on our side coming off of last year. Arpino was just unbelievable today. I certainly wouldn't want to pitch to her. She is clutch and hits the ball so hard." With Patriacca painting the corners, and serving up a solid rise ball, the frustration continued to mount for the Colonial hitters. Despite making contact much of the time, most of the batted balls were directed towards the Newton North defense, who piled up the putouts. The Tigers, who finished with 10 hits against Meinhold, added another tally in the top of the fifth as two more errors paved the way for pinch-runner Lauren Miller to score from third. Patriacca capped off the final two frames by allowing just one hit. "I think as a team we have gelled a lot more since earlier in the season," said Baugher. "We had four losses in a row which was kind of hard. We sort of had to re-group and talk about what we wanted to do as a team and what we could do to help one another. It has paid dividends and I'm really proud of this group of kids." Acton-Boxbrough, meanwhile, seems poised to return stronger in 2019 with a quality core group coming back. "(Patriacca) dominated us today," A-B coach Mary Bassett said. "Our bats just felt silent against her. I think our defense, and the miscues, got the better of us. We made some mistakes that we don't normally make typically. It's disappointing but we only lose two starters and three seniors. If this isn't motivation for the kids coming back next season then I don't know what is."